Provide the field with a title here. More information about this topic can be found here. This setting means the title will be displayed in the edit field when it is viewed in the browser. With this setting an edit field will be made a mandatory field. With this setting, editing will be prevented. With these settings, the edit field will then be shown as a color field that is filled with the currently selected color. 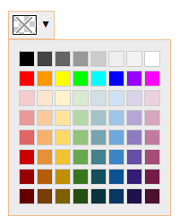 Clicking on this opens a palette where the colors can be selected. HTML5 has its own color palette. However, not all browsers support HTML5. With this setting, the HTML5 control is used if the user accesses the page with an HTML5 browser. If the browser does not support HTML5, the default color palette is used instead. On mobile end devices, the color palette will be presented as in the image below. 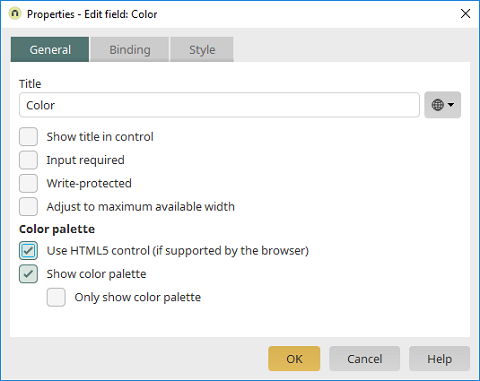 This option, and the option below, refer to the default palette, not to the HTML5 control. 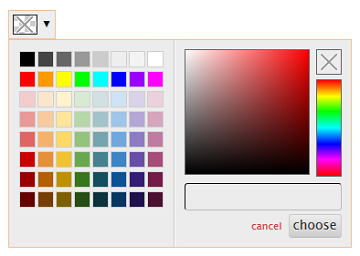 With this setting, the entire default palette is shown. On mobile end devices, the color palette will be presented as in the image below. If this setting is activated as well, only the left-hand area - meaning just the palette itself - is shown. 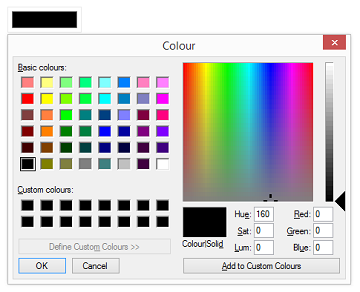 For more information about the color picker, please click here.